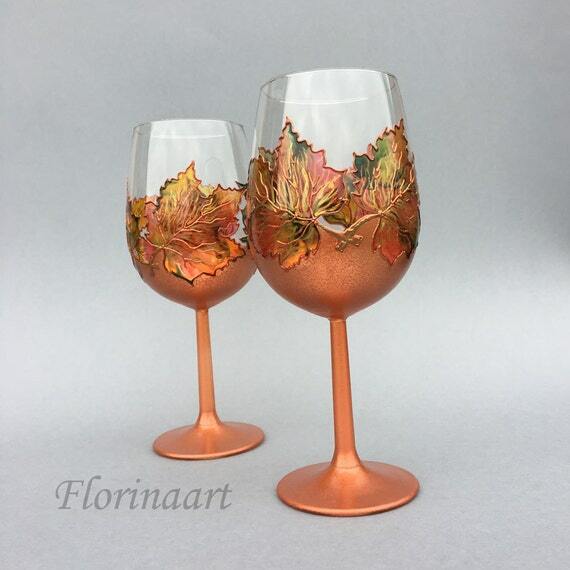 Copper Anniversary, 7th Wedding Anniversary, Copper Glasses, Wedding Flutes, Wine Glasses, Hand Painted Glasse..
A set of two wine glasses decorated with maple leaves in warm, autumn colors such as gold, brown, orange, yellow, green and copper. The stems of the glasses are in Vibrant Copper color . The leaves are transparent and looked on direct sunlight the colors seem to glow beautifully. Each of them can be personalized on the base . Please take into consideration the text will be hand written with glass outliner in suitable color and it can not be longer than 20-25 symbols due to the small base of the glass. The items come in safety packages. They are protected from breakage.